At All Saints Academy we prioritize reading! Reading is an integral part of our day-to-day routines. We are working to increase access to good literature for all our students, and we have also invested in creating contemporary, welcoming, and functional Learning Labs at both campuses. Reading helps develop the mind, imagination, and creativity. It is a foundational component of learning new things and developing a good self image. Good reading skills improve spelling, grammar, and writing skills. It is fundamental to functioning in society and important in looking for employment. Reading connects us to and informs us about our Catholic faith. In the bible, Jesus is referred to as the Word of God. At ASA we are also very aware of the importance of helping our students select books appropriate for their reading ability, age, and maturity. Common Sense Media is a site that provides us independent reviews, age ratings, and other information about the books we select for our library. When our students suggest titles to add to our inventory, it is a go-to site for us to check out the content of the books before purchasing. Anyone can use it! .At the elementary campus, books are sorted by age level. 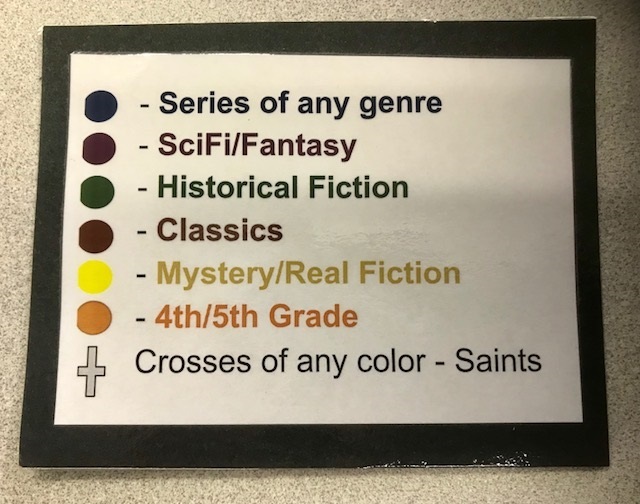 At the middle school, because our readers are required to read across the genres in their literature classes, books are sorted by genre and series. Currently, we are beginning work to create a young readers section to highlight books for our fourth and fifth grade readers. Among a number of other reading strategies to assist some of our struggling readers, teachers have begun to use audio books for students to listen as they read, as well. We want to encourage you, the primary educators of your child, to continue to partner with us by becoming more and more actively involved in your child’s reading, as well. Talk with your older children about what they are reading both at school and at home. Talk to them about what they are learning and the new ideas they are exploring through their reading. For older students, consider reading alongside them as they begin to select books that explore life more deeply. Did you know we have a new library system and you can access our card catalog via the Library World website OR Mobile App? Our library names are ALL SAINTS ACADEMY ELEMENTARY and ALL SAINTS ACADEMY MIDDLE SCHOOL. There is no password. The libraries are joined so both parents and students can look up books in either library. We are not using the Holds or Request features at this time, but we may add that later. For now, you can see what books we have available in the learning labs at both our campuses. Mobile device app in the App Store for iPhone/iPad, or the Play Store for Android - search for LibraryWorld. The web site is bookmarked for both teachers and students in the ASA Bookmarks folder so your son or daughter has access to this information also. Whether you use the website or the app, the user can search for books by any field (author, title, keywords, target audience, reading level, etc.). The results can be sorted, selected books can be added to the clipboard, and the clipboard can either be viewed or printed. With the Library World system students receive late notice messages to their ASA email when they have a book past due. Did you know that they also get a transaction list email indicating what books they have checked out and when they are due? Asking your student to either share their library login or these weekly emails would be a great way to spark conversation about what your students is choosing to read at school. Our mission is to serve and partner with our families, parishes, and communities as we focus on the spiritual, intellectual, moral, social, and physical development of our children as we work to Form Saints to Serve All. We are always looking for volunteers to support us in this great work. If you would like to spend time volunteering in either of our Learning Labs, please contact either of our school offices. I attended a recitation of the Rosary at ASA Middle School last week. It was different than I expected. I came with a mind-set. I took along an extra rosary in case one of the children might need one. I later saw that this was surely not needed. The previous evening, I participated in the Diocese “Bridging Faith and Future” Board Summit. This was a meeting of school Boards of Directors from around the diocese. Bishop David Walkowiak spoke about the need for Catholic schools in our society. He said that one essential role for Catholic schools is to teach children how to pray and he mentioned the rosary as an example. I was eager to participate. The children filed into the Gym a few minutes before 8:00, chatting quietly with each other. As the 8th grade came in, several scooted through the gym down the opposite hallway. I wondered what was going on. A few minutes later, they returned with a huge rosary that they spread on the floor in a large circle. Younger children scrambled to stand around the rosary, eager to hold a bead. When all the beads were taken, older students were welcomed to be a prayer buddy. They stood with a younger child at their bead. Others sat on the floor in the middle of the circled rosary. With the count of 5-4-3…all were silent. “Good morning Ladies and Gentlemen,” said Miss Giroux. “Who remembers what has been our theme for the week?” Several hands went up. “Vocation Awareness,” answered one of the younger students. All were invited to think of a priest or sister they knew and to offer the rosary for them. The group was then directed to call to mind other intentions for which they wanted to pray. Everyone was encouraged to share their intentions with one other person near them. Miss Giroux noted that, since this was a Friday, we would recite the Sorrowful Mysteries. She reminded us that because Jesus suffered so much, we could trust that He would share any pain, suffering, or anxiety. He would always be with in hard times. The rosary began. A set of 8th graders lined up at the microphone. One began by leading the Apostles Creed. Then one by one, the child holding a bead lead their designated prayer: The Our Father, the three Hail Marys, and Glory Be to the Father prayers. The next 8th grader in line at the mic announced the First Sorrowful Mystery. He gave a brief meditation focused on the Agony in the Garden. As before, the child cradling the next bead lead the appropriate prayer – Our Father, Hail Mary, Glory Be to the Father – all others answered. The decades were punctuated with the Fatima Prayer: Oh, my Jesus, forgive us our sins…. You could feel the reverence, the recollection. At the end, all present recited the Hail Holy Queen. When recitation of the rosary was finished, the “carriers” stepped forward to return the rosary to the wall where it hangs. This rosary is a prayerful reminder for those who pass by in the hallway. The next time you see EL Rosary or MS Rosary on the calendar, why not attend? You too will be inspired. David Sacha in front of the coast of Amalfi in Italy, near Pompeii and the island of Capri. Say yes to service, & listen for God in the silence of your heart. During Vocation Awareness week 2017 we want to encourage you to pray for vocations, pray to be open to God's call in your life and the special mission he has for you, & pray for our seminarians like David Sacha! This article was featured in our recent newsletter, but we thought it would be great to share it again here! David Sacha is a senior at Saint John Vianney Seminary and graduate of both All Saints Academy (2010) and West Catholic (2014). His family are active St Alphonsus parishioners. David started his Catholic school career at St Isidore and made the switch to All Saints Academy with his classmates in 7th grade when ASA opened. According to David his two years at ASA were exciting due to bigger classes, more people to share ideas with, more band options and the hardworking teachers committed to helping students learn and maintaining a strong Catholic identity! David recently returned from a semester studying abroad in Rome with the Catholic Studies Program at St Thomas University. He was struck by the universality of the Church during his time in Rome as he was privileged to study and pray with priests from Romania, Haiti, Africa, and Italy, as well as a groups of Irish seminarians. These men became role models and excellent images of universal Christ-centred lives for David. David went on to give advice to all those seeking God’s call in their own lives, whatever that call may be. He pointed out that this world is full of noises and demand telling us where to go and what to do. Inspired by Saint Therese of Calcuta he continued “this is not the Lord’s invitation. Vocation arises from the deepest places in our heart, not from the world. Listen to you heart in silence, in front of the Blessed Sacrament.” David emphasized the importance of quiet time with Jesus in the Blessed Sacrament. He noted that “no one delights in us more than Jesus!” so we should quiet ourselves enough to listen to him in his presence. Please join the ASA community it praying for David this year. He specifically asked for prayers that he may be a holy, pure and loving priest! This past summer when a group of seminarians went to a cottage for a few days to relax! Just enjoying some spiritual reading! Saint Raphael the Archangel, Pray for us! Saint Demetrios, Pray for us! Saint Gregory, Pray for us! Saint John the Apostle, Pray for us! Saint Therese the Little Flower, Pray for us! Saint Sebastian, Pray for us! Saint Jude, Pray for us! Saint Martin of Tours, Pray for us! Saint Patrick, Pray for us! All the holy men and women in Heaven, Pray for us! Eternal rest grant unto them, O Lord, and let perpetual light shine on them! Forming Saints to Serve All as we step into the next 10 years of ASA!